Rabbi Diane Cohen: "The Change Conservative Judaism Needs"
What a joy to be back in New Jersey, where I spent eight wonderful years with my community in Colonia. As I look out at the faces in this room, I can truly say that I am home. And I'm delighted to share some reflections on this week's Rabbinical Assembly international convention, held this year at the Jewish Theological Seminary in Manhattan. The last morning of the convention, I sat in a session on mystical aspects of prayer and found myself actually "getting" the connection between kabalah (which I've never pretended to understand) and normative Jewish prayer – and there's a lot to be learned there. More important, though, was the very fact of a session on kabalah and prayer at the Rabbinical Assembly. Thirty years ago, this would never have been so. Neither would alternative minyanim that featured meditation. I met with colleagues who, like me, are on the road again, and in this bleak economy we commiserated and worried about our future. Synagogues are merging, associate positions are disappearing, and colleagues with kids in college are scared. New rabbis are being minted – will they have a place to go? New cantors are being invested – are they being prepared for a movement that no longer expects a Presence on the bima, performing for them, but rather a song leader? History was made this year, as Rabbi Julie Schoenfeld was installed as our organization's first female executive vice president, and Rabbi Gilah Dror was installed as our first female international president – first woman, first Israeli-born as well. But I suspect that the issue that most attendees will take away with them – us – is the challenge by Rabbi David Wolpe, the first night of the convention. We need to re-understand, re-invent our movement. We need to be less hazy. We need to be able to put what we believe on a bumper sticker. I must tell you that most of the speakers that followed him this week expressed discomfort with that notion. And in truth, you can't summarize anything as complicated as Conservative Judaism in 5 words. That's not fair to our product. But frankly, I think one of the issues we had with Rabbi Wolpe's mandate is that in order to sell a product, you need to understand the product. Until we figure out what we stand for, we can't sell it to the world. We may love it, but until we can define it (and perhaps by defining, limit it), we shouldn't be worried about a bumper sticker. Because we really do have a lot of work to do, and it's not about defining Conservative Judaism. Defining is about what is. Conservative Judaism is about fluidity, adjustment to modernity while remaining true to our Torah roots, and as modernity changes, so must we. What was true about our movement 50 years ago is no longer true. Our synagogues look different. Our leadership looks different. And clearly even our professional conventions look different. Our task is to figure out not what defines us but how we are propelled, how we develop, how we think about change. And for that we need to look to one of our movement's greats, Rabbi Mordecai Kaplan. Kaplan, whose thinking informed generations of Conservative rabbis, is credited with founding the Reconstructionist movement. He saw all of Jewish practice not as commanded by God but as having arisen from the people, and what the people have sanctified remains. Women have lit candles for centuries, so women continue to light candles. Musical instruments were used in the Temple but not in synagogues, but the people have dictated that musical instruments would be nice to have in our services, and so in some congregations, guitars and drums are making appearances. If you look around the movement today, some Conservative congregations still do not include the ritual participation of women. Others are served by women rabbis. Some have instrumental music. Others do not. Some permit pot luck Friday night dinners. Others do not. So indeed, how can we define Conservative Judaism, given the fact that I, as an ordained rabbi and member in good standing of the Rabbinical Assembly, would be refused an aliyah at congregations served by some of my colleagues, similarly educated and similarly affiliated? We used to talk about tradition and change. I don't think anyone knows what that means any more. I think worrying about our movement's definition is less important than imagining how our synagogues will look in 5 years. What will the services look like? And that's not the job of the rabbi and cantor. That's the job, in good Reconstructionist practice, of the people. There's an old bumper sticker that proclaims, "When the people lead, the leaders will follow." So where are the people leading? We need only look around at the upsurge in independent minyanim that have sprouted up over the last 40 years, beginning with Havurat Shalom in Massachusetts and spreading across the country. The havurah/indie movement began when our kids graduated from Camp Ramah and USY and Pilgrimage and Solomon Schechter schools and wanted more than our cathedral synagogues were offering, so they started their own sacred spaces. That continues to happen today. I ran into a former student on Thursday, now married, living on the Upper West Side, and attending Hadar, one of the most exciting indie minyanim in the country. But she acknowledges that she and her husband will no doubt leave when they have children and want a more diverse community. I was delighted to see that she was aware that kids deserve to see older people in their minyan, people saying kaddish, the elderly…kids need to be able to look around and see people not like Abba and Ima. Indie minyanim seem to be the undergraduate world for today's twenty- and thirty-somethings. The question is, where will they choose to go for graduate school? To mix metaphors, where will they go when they're ready to take off their training wheels? That's the challenge of the Conservative synagogue in the 21st century. What might these young people want? Certainly, more participation, more empowerment, more ownership of the community. But what else they might want will take us back to convention and the opening night concert. The headliner was Neshama Carlebach, but the real hit of the night was her backup group, the Green Pastures Black Baptist Choir. Holy moly, did they rock the room! If you have ever attended a service at a Black Baptist church, or any Pentecostal church, or invited a choir to your community for an interfaith service, I don't have to say another word. The music they sang was Carlebach music, but they made it their own, and did they ever do it well. But here's what happened. By the end of the second number, there were two people standing and clapping along. One was a Black woman who'd come with the choir. You're looking at the other one. Not only did I stand because I simply couldn't stay in my seat, I thought that maybe if one person stood, others would follow. Not so much. Now, by the end of the evening, most of us were standing, clapping, some even dancing around the room. They got us going, but it wasn't easy. We seemed determined to be an audience. No one bothered mentioning that we were supposed to be part of the performance. Because after all, as someone once observed, when it comes to praising God, it's not about performer/audience. We're all performers. God is the audience. I've spent a good deal of time reflecting on my experience at convention, on the resistance of my colleagues to get off their chairs and get into the music, and it's occurred to me that we Jews just don't feel comfortable doing this stuff. Back in Temple times, we brought our sacrifices to the priests, the Levites did the music, and we watched. In the 18th and 19th centuries, the hasidim danced while the misnagdim sat in their yeshivas in Vilna and scowled. For the most part, we are not happy moving and clapping and, as our Christian friends would say, letting the Spirit flow through us. That is a problem. I have a Presbyterian friend who regularly observes that his people are the frozen chosen. I am very fearful that our Conservative community will end up that way as well. The midrash tells us that God created six other worlds before creating this one, and what made this one special is that it includes people – us. Why? Because before this world, God had only the angels, and they praised God daily, but that was their job, and since angels have no free will, of course that's what they did. And God was bored. So God created people, and I suspect God hasn't been bored since. But maybe not. When was the last time you noticed something God did? Like blooming flowers, or a sunset, or your baby? When was the last time you experienced what Heschel called radical amazement? What did you do about it? Say, "That's so nice"? Feel really good inside? I think what our communities lack today is real excitement. On Friday nights we sing a psalm that ends yis'm'hu hashamayim v'tageyl ha'aretz. Think about those words. The heavens and the earth will rejoice. What does rejoicing look like? Then think about the melody Conservative congregations use all over the country. Yes, there's a hand-clap. But sorry, it wouldn't even wake up the heavens and the earth, much less lead them to rejoice. We have been raised by generation upon generation of Jewish tradition to be observers, audiences, people who sit back and let others do for us. Our young people will not accept that any more, and when they walk into a room where the music is nice – but only nice – they may sit for the morning, but they won't be back. When an innovation felt especially uncomfortable to me, the feeling was visceral, almost like disgust, something I couldn't always think away... But I discovered that I could modulate my response to innovations. I could remind myself that my unfamiliarity was not sufficient to disqualify the potential blessings of a new practice. We have all learned to overcome multiple gut responses to unfamiliarity. Who isn't terrified on the first day of school? But still we press forward and walk into the classroom. I noticed that ritual practices clearly borrowed from other cultures made me feel especially uncomfortable. I realized I could either choose to resist the practices or I could give them a chance. I could consider the plausibility of their fit and evaluate their spiritual power in light of any ruptures they might impose. I could train myself to notice my hesitancy in the face of a new ritual and contemplate it. Then I could let go: I could watch, wait, and perhaps, eventually, accept. What Ochs says about new ritual we can say as well about the music of excitement. We deserve to be excited about being Jewish and about coming together on Shabbat to thank God for our many gifts. We deserve it and God deserves it. Let me close with a poem by Yiddish poet Aaron Zeitlin. Curse Me, says God, and I will know that you love Me. Sing out My graces, says God. Raise your fist against Me, and revile, says God. If you sit entrenched in I don't give a hang, says God. We are writing to invite you to join our November 2010 Jewish Leadership Delegation to Israel in Support of Women of the Wall. See details below and the pdf attached to this letter. The delegation is being organized by the West Coast Women of the Wall Organizing Committee (i.e. West Coast of the United States). Rabbis, cantors, board members, staff, lay leaders and other leaders of Jewish institutions, organizations and communities worldwide are welcome and encouraged to apply. Please forward this information to all who might be interested. that flow so well from it) in service of the world. failure of the choreography, a shortcoming of the rituals themselves? No. Ritual works. Ancient Jewish ritual works incredibly well. person in shul to see themselves as seekers of the sacred. sing and cry from the blessed weight of it all. The Jewish Week: "JTS Chancellor Charting New Course For Outreach"
Call it chutzpah or commitment — or a combination of both. Even as the Conservative movement is losing members left (to the Reform) and right (to the Orthodox), literally, the chancellor of the Jewish Theological Seminary is setting his sights not just on survival, but on expanding the school's focus, "carefully but boldly," throughout North America. Arnold Eisen, completing his third year in his post as head of the educational and spiritual center of the movement, is launching a campaign to roll out "a new JTS mission that defines our purpose and sets our future direction," with an emphasis on "learning, leadership and vision." Considered too low-key until now by some critics, he plans to enlarge his duties as a spokesman for "what Judaism has been and can be," and take on the mantle of "intellectual leadership." Welcome to the Eisen Era. In an exclusive interview with The Jewish Week three days before Monday's JTS commencement, at which he formally announced his vision, the chancellor explained its development and goals with passion and conviction, including providing his own view of what he considers the most important point. "Here's the vision headline," he said toward the end of our 90-minute discussion: "This great institution, long known for its distinguished scholarship and innovation," like establishing Camp Ramah and The Jewish Museum, "now will bring its resources of learning to bear in new ways on the needs of the North American Jewish community." He acknowledges that the Conservative movement, once the largest of the four Jewish denominations, has shrunk, and that its numbers continue to decline. But while some say the movement's demise is inevitable, if not imminent, Eisen says he remains an optimist and chooses to measure success "by quality rather than numbers," looking to "the potential for major achievement." Eschewing pessimism at a time of "notable failures," increasing assimilation and diminished financial resources, he asserts that "fewer people are involved [in serious Jewish lives] but they are more involved. "Instead of counting our losses, let's seize the moment," he insists, while agreeing that the moment is one of urgency and in need of a large dose of innovation. Eisen, 59, a longtime religious studies professor at Stanford University prior to coming to JTS, and only the second of its seven chancellors not to hold rabbinic ordination, is banking his reputation and legacy on this new plan to reach "Conservative Judaism and the vital religious center of North American Jewry." He defines that center as including Orthodox, Reform and unaffiliated Jews serious about deepening their Jewish knowledge and commitment. "This is an exciting moment for me and for JTS," he said, explaining that the key to success is to make better use of what JTS, established in 1886, has long been best known for — its scholarship. He asserted that "first-rate, excellent scholarship" is at the core of his vision, soon-to-be policy, of outreach. Eisen noted that the Conservative establishment is already reaching Jews outside of the movement through its Camp Ramah, about 20 percent of whose families are not affiliated as Conservative, and a slightly lower percentage of families whose children attend Solomon Schechter day schools. With an estimated 20 percent of American Jewry apparently uninterested in affiliation of any kind, and another 20 percent highly involved (and mostly Orthodox), Eisen's target audience is what he calls "the big middle," which he hopes to reach by stressing the importance of a balanced center, and by adding thoughtful, relevant content. "They are in play," he says of the 60 percent of American Jews he is focusing on, "and they can be won over through meaning and community." Eisen hastens to add that he is a pluralist and wants the Reform and Orthodox movements to be strong. "We're not trying to shove anyone else aside," he says, noting that he works together, when possible, with the heads of Yeshiva University and Hebrew Union College. But he believes JTS has a vital message, and responsibility to serve a post-denominational generation, which he describes as "younger Jews who don't want to see a denominational adjective before the word 'Jew.'" He says "it is not a failure if Ramah alumni become Orthodox, because it means we help make live, committed Jews. That's a success." He also speaks with pride of high-achieving graduates of JTS now involved with creative new projects like independent minyanim, service programs and spiritual outreach outside the confines of the Conservative movement. "JTS equipped them with the tools to be innovators, to be caring, educated Jews," he says, emphasizing that his broad goal is to help increase the number of serious, active Jews in North American life. Several Conservative rabbis, who preferred not to be named, commented on the new vision, and their views ranged from enthusiasm to cynicism. One welcomed the vision statement for "defining what the Conservative movement is rather than what it isn't," and for "attempting to place JTS in a position to capture the center — a real effort to reach beyond our constituency." But another said the vision's emphasis on scholarship rather than spirituality is out of sync with the times, and that essentially it was window dressing to couch the fact that JTS needs to make financial cutbacks. The practical plan is to train rabbis and cantors to be leaders who can balance their knowledge with the needs of contemporary Jews, and to focus on more systematic coordination among the five schools of JTS: the rabbinical school, cantorial school, graduate school, Davidson Graduate School of Education and List College of Jewish Studies, affiliated with Columbia University. A 30-page strategic plan outlines broad strategies for reorganization and extended engagement with the community, including service through scholarship; making use of campus synergy through interdisciplinary shared learning; partnerships with a wide range of other schools and programs in New York City; and reaching new types of students, primarily through adult education programs at JTS. In general, the emphasis is on responding to financial constraints with innovation and partnerships, both within JTS, with other institutions and with funding foundations. "We as a community have been inadequate in fashioning institutions," Eisen says, adding that JTS has not been sufficiently "hands-on and entrepreneurial." The school's current academic structure will be "significantly streamlined," according to the plan, with core courses created in each of four main areas of study, including a "state-of-the-art approach to leadership education." List College of Jewish Studies (undergraduate) and the Graduate School will be directed by one dean, Shuly Rubin Schwartz, current dean of List College. The rabbinical and cantorial schools will operate under one dean, Rabbi Daniel Nevins, current dean of the rabbinical school. The subtext here is that with the Conservative movement long plagued by lack of coordination among its many branches, including the United Synagogue, Rabbinical Assembly and JTS, Eisen appears to be broadening the scope of JTS by bringing more of the educational arm of the movement under its wing. In the end, it remains to be seen whether Eisen can reinvigorate his movement. His most ambitious project to date has been an initiative, complete with curricula, for congregations to focus on mitzvot — their meaning and application today. He says it has had much success, with several dozen congregations sponsoring weekly discussions on what it means to be commanded in the 21st century. Aside from leading to increased personal observance for some participants, Eisen says another objective was to blend text study and practical application, and for the rabbis themselves to talk openly about their own views on mitzvot. More congregations are initiating the program and there are plans for a stage two for congregations that completed it. Eisen likes the idea of synagogues taking on a particular cause, be it feeding the poor or establishing a chevra kadisha, and making it their own "signature" mitzvah. In the meantime, it is clear that he sees the new strategic plan as the centerpiece of his chancellorship. It reflects, as does the mitzvah project, his attempt to combine the head and the heart in reaching both professional Jews (rabbis, cantors, teachers) and laymen in a mix of study and action to deepen one's Jewishness and humanity. "We dare not fail to respond with all the boldness and experience at our command," he said in closing his commencement speech Monday. "Let's get to it." Forward.com: "Facing Financial, Identity Crises, JTS To Reorient Historic Mission"
Published May 19, 2010, issue of May 28, 2010. Conservative Judaism's flagship educational institution, historically at the forefront of academic Jewish studies, has announced a new strategic plan that reduces the number of its doctoral programs and focuses more on engagement with the Jewish community. New Path: JTS Chancellor Arnold Eisen says this is a time of change and challenge. The Jewish Theological Seminary's new strategic plan, described by the school's chancellor, Arnold Eisen, at its May 17 commencement ceremony, comes in the midst of a financial crisis that has rocked JTS, and a broader identity crisis within the Conservative movement as a whole. "We began the process of institutional examination and renewal fully aware that this is a time of rapid change and massive challenge," Eisen told a packed crowd of graduates and their families. "The possibilities for growth and renewal today may be less readily discerned and less frequently noted than the obstacles that confront Jews, but they are truly remarkable." Earlier this year, JTS stunned students and faculty with the abrupt announcement of the elimination of the position of dean of the H.L. Miller Cantorial School and College of Jewish Music, held for over a decade by Henry Rosenblum. The announcement, made on a Friday, caught cantorial students off guard. At the time, the chancellor said that JTS was struggling with a budget shortfall of $3.8 million. Under the new strategic plan, detailed in a document released shortly after the commencement address, JTS's cantorial and rabbinical programs will be overseen by a single dean, and another dean will head its graduate school and undergraduate programs. Further, the school's 17 academic departments and programs will be reorganized into four large departments, each under a broad rubric such as Jewish Languages or Jewish Cultures and Communities. School officials describe a reorientation of the school away from its once-dominant role in the world of academic Jewish studies. "Once upon a time, there was no academic Jewish studies in colleges and universities," Eisen told the Forward. "So you had the possibility of a place like JTS, which concentrated a huge percentage of the faculty resources in Jewish studies in North America." Given the growth of the discipline of Jewish studies, Eisen said, "That day will never return." Instead, the school will focus on a few sub-disciplines of Jewish studies. Eisen said that the faculty was in the process of determining what those sub-disciplines would be. Eisen emphasized, both in his address and to the Forward, that JTS will retain its emphasis on scholarship. "JTS is going to remain a place of first-rate scholarship and teaching. It's going to remain a preeminent intellectual center in the field of Jewish studies," he said. "You can't pursue my ambition of bringing first-rate scholarship to bear for the benefit of Judaism and the Jewish community unless you have first-rate scholarship." The plan calls for "a substantial reduction in the number of doctoral programs," alongside an expansion in master's programs. Eisen told the Forward that he did not foresee a reduction in the number of doctoral candidates enrolled in the school. "I think there's a change in emphasis from more of an ivory tower atmosphere to a sense of the seminary's connectedness to the Conservative and centrist Jewish community, and to the Jewish community as a whole," JTS's provost, Alan Cooper, said. Burton Visotzky, a JTS professor and former dean of its graduate school, said he was not concerned by the change in emphasis described in the plan. "I think it allows us to move towards more interdisciplinary work, to do the kind of hiring and collegiality that was difficult to do under the old system of so many different departments," he said. But Michael Berenbaum, a professor at American Jewish University in Los Angeles, said that a reduction in the number of doctoral programs will make it difficult for JTS to retain top professors. Given that leading universities throughout the country run Jewish studies programs, Berenbaum said that academics, facing fewer opportunities to work with doctoral candidates, may choose to go elsewhere. "There's clearly a retrenchment that's going to impact on the ability to recruit and maintain great faculty," Berenbaum said. Eisen, however, said that he did not believe that JTS would have a problem attracting top scholars. He said that Jewish studies programs at other institutions also have chosen to emphasize areas of specific expertise. In his speech to graduates, Eisen emphasized new programs that will bring the school in greater contact with the broader Jewish community. He announced plans for classes starting this fall for New York-area adults not enrolled in the school, emphasized the importance of the school's library and said that continuing education for professionals working in the Jewish communities would be "a core element of the mission." "Just as the walls separating schools and disciplines inside JTS will come down, so will the walls dividing full-time students on campus from part-time students in the surrounding areas," Eisen said. The school's new strategic plan also outlines a new emphasis on practical skills for rabbis and cantors, such as pastoral care and fundraising, alongside scholarly work. Berenbaum, who studied at JTS as an undergraduate in the 1960s, said he saw this as a positive development. Generations ago, he said, JTS "really wasn't interested in what these rabbis did in the pulpit, it was interested in what these rabbis did in the classroom." The plan also attempts to reassert JTS's role at the head of the Conservative movement. In recent years, the traditional sense of JTS as the Conservative movement's central institution, and of its chancellor as the movement's titular head, has diminished. It is no longer the only American institution ordaining Conservative rabbis, a role that it has shared with the Ziegler School of Rabbinic Studies at American Jewish University for more than a decade. And with the installation of Eisen as chancellor in 2007, JTS no longer has a rabbi at its helm. "In short, we shall reaffirm JTS's role as the primary religious, spiritual, and leadership fountainhead of Conservative Judaism," the plan states. The plan sets as a fundraising priority the development of a new institute "devoted to the future of Conservative Judaism and the vital religious center of North American Jewry." While the text of the plan states that it "was never conceived as a budget-cutting exercise," it acknowledges that it has been "devised with full awareness of the desire to improve JTS's financial condition." To that end, it outlines a number of new initiatives to increase revenue, including heightened focus on soliciting more small gifts from donors and the establishment of tuition-generating part-time programs. As we prepare to receive Revelation this evening, I share with you the message (below) from Rabbi Michael Siegel, chair of Hayom: The Coalition for the Transformation of Conservative Judaism. It is also with a deep measure of pride that I point to the "Transparency and Congregational Involvement in the Process" in Rabbi Siegel's message, in which he explains that the ShefaNetwork will be the venue for discussion of many of the issues raised by the Hayom/USCJ joint project, the Strategic Planning process for the USCJ. I wanted to share the progress of the work of Hayom. Included in this email are excerpts of a recent progress report that was shared with the members of Hayom. As you can see, we are moving forward in a very positive way! I hope that you will make every effort to attend this important session. In addition, if you are not currently a member of Hayom, I hope that you will give strong consideration to join our coalition for positive change for the Conservative Movement. A meeting was held on Wednesday, May 5th in New York City at NYU. The purpose of the meeting was to lay a framework for the process. Steven Cohen reported on the results of a survey that was sent out. One of the noteworthy findings is the high percentage of Conservative congregations who look to the USCJ for expertise in a whole variety of areas pertaining to synagogue life. While the survey did not measure the congregation's level of satisfaction, Jack Ukeles reported that other surveys that they have conducted often show a much high percentage of stakeholders who simply walk away if services they seek are not provided in an adequate way. While the fact that a high percentage of congregations continue to look to the USCJ must be understood as a positive, the reason for this continued loyalty has not been properly studied. The same survey reported that most Conservative congregations are struggling with significant financial pressures. Another positive element of the meeting was the openness of the parties involved. There was a clear atmosphere of cooperation amongst all of the participants. As Steven Cohen noted, often when there is a well established institution and an agitating group demanding change the lines remain drawn and groups remain entrenched in their positions the relationship between Hayom and the USCJ leadership was clearly different than that. An excellent draft mission and vision statement is in the process of being hammered out. While it is still in a rough stage we should be ready to distribute them shortly. One element of that discussion that I would like to share is the use of the term Kehillot/religious communities instead of synagogue. This is a clear acknowledgement that a variety of new entities are developing that are different from the classic synagogue models The fact that the leaders of the USCJ displayed such an openness to a veritable redefinition of synagogue as it has presently been understood is notable. It is also clear that the more contentious issues will be the focus of subsequent meetings. However, by everyone's estimation it was an excellent start. The Strategic Planning Commission will have three meetings -- in June, August, and then in October. Our June gathering will be to conduct what Jack Ukeles has termed a "clean piece of paper exercise." That is, if we were starting to create a synagogue organization today what components would we include? What goods and services would we want to receive from this organization and how would we want to see them executed? The UAI team is beginning a detailed analysis of USCJ current operations -- relating program, cost, revenue and mission. This will take several months and the results will be reviewed at the August meeting. The October meeting will focus on integrating the "ideal" developed at the June meeting with the best of the current USCJ operation (identified at the August meeting) to create a strategic direction for a viable entity. The strategic plan will be completed by the first of the year. Webinars: Jack Ukeles and Steven Cohen will hold three webinars for Hayom and other USCJ members in order to present their findings and to entertain questions and solicit input. Monthly emails: Rabbi Ed Feinstein and Jack Finkelstein serve as the co-chairs of the strategic planning commission. They will prepare monthly emails discussing the progress of the commission. They will also present questions for discussion. Electronic Forum for Discussion: Rabbi Menachem Creditor has graciously offered to make the ShefaNetwork a place for discussion. Rabbi Ed Feinstein has requested that before the June meeting that he have the benefit of the thinking of as many congregations as possible. In order to accomplish this we will be asking the Hayom congregations to take the time to participate in a clean piece of paper exercise. This would require leaders of synagogues to create a 1-2 page document describing the services that they would like to receive from a synagogue organization. To his credit, Menachem Creditor has conducted such a discussion on the Shefa Network. Each congregation will receive a condensed version to get an idea of some of the current thinking on the subject in order to consider the possibilities from new vantage points. You will also be asked to identify your current membership, so that we can acknowledge the different needs based upon congregational size and location. The form and the process are currently being hammered out and you will receive the information shortly. Along with the original representatives of the USCJ and the Hayom Commission we have added representatives from the Educators Assembly and the Cantors Assembly to ensure that we are well represented in our deliberations. Hevre, we are moving forward! While it has taken a great deal of time and effort to get us to this position, it should also be said that this is the first time in the history of our movement that the stakeholders themselves have ever been organized across these lines. The fact that we have lay leaders, Rabbis, Cantors, and educators all joined together in such a coalition is a significant accomplishment. We have a powerful voice that is being heard and taken seriously, by the leadership of our Movement. If you have any thoughts, questions, or comments please do not hesitate to contact me at Hayomcoalition@gmail.com. I am delighted to let you know that Rabbi Julie Schonfeld, Executive Vice President of the Rabbinical Assembly, recently announced the launch of the Rabbinical Assembly-Camp Ramah Partnership, a renewed effort by the RA to promote the Ramah experience as a crucial ingredient for Jewish identity growth. On Monday, May 24, I will address the Rabbinical Assembly Convention to discuss this exciting new initiative. I encourage you to read Rabbi Schonfeld's wonderful article below. This article, emphasizing the importance of Ramah camping, appeared in the April-May 2010 RA Newsletter and announced the establishment of this joint venture. With the approach of summer, I am delighted to direct your attention to the launching of an important new venture: the Rabbinical Assembly-Camp Ramah Partnership. 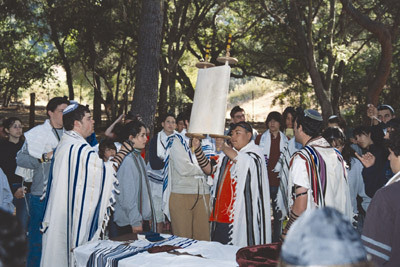 ...Numerous studies confirm the Jewish summer camp experience as one of the most potent transmitters of Jewish identity and Ramah as one of the most successful Jewish camping models. While summer can sometimes be a quieter time for Jewish institutions, giving way to preparation for the Yamim Nora'im, and the activities of the new year, Camp Ramah teaches us that summer time is a precious opportunity to share with our people what it means to put our lives on "Jewish time." Camp Ramah's model of infusing every aspect of "regular life" at camp with holiness, whether it be tefillot in an exquisite setting or bringing Jewish values to the intense relationships of camp bunks, has had a transformative impact on tens of thousands of Jews. There is no disputing the fact that Ramah alumni number not only many of the leaders in Jewish communal life, but are also dugmaot of yiddishkeit throughout our communities. With regard to Stewart Ain's article ("MK, Non-Orthodox Clash On Conversion," May 7) and MK David Rotem's assertion that "he denied promising to withdraw the [conversion] bill if he failed to win the support of ... leaders ... here," I can tell you I was present at four of his meetings and he often made just such a statement. It was then generally followed by the comment he would tell the olim from the former Soviet Union to blame the Americans for the lack of progress. The sad part of Rotem's visit was not that we failed to agree, but that it became clear he simply does not understand diaspora Jewry. Thus, when he says we should not care about his bill because it does not affect conversions here (a statement which is not clearly certain) he fails to understand our link to and deep concern for the Masorti and Reform movements in Israel as well as our commitment to pluralism in Israel. If giving "responsibility" for conversions to the Chief Rabbinate were as "meaningless" as Rotem tried to assert, he would not have been so resistant to acceptance of clarifying language. Finally, as to suggestions for how to improve the proposed bill, Rotem is reported to say we made none. In fact, we repeatedly said he should consult with our colleagues in Israel as we did not think it our place to negotiate for them the specifics of the Knesset bill. What Rotem seems to want to do is separate us from our Israeli partners. That will not happen. Fwd from the Masorti Foundation: "Have You No Shame?" Even for those passionate about the cause of pluralism in Israel and respect for non-Orthodox streams, this is a story that prompts disbelief. Noa Raz, a young woman who is a product of the Masorti movement and its NOAM youth group, was physically assaulted in the Beersheva bus station by a haredi man. Why? Because he could see t'fillin strap marks on her arm and called her an "abomination." Noa reports she was grabbed and kicked and the man otherwise attempted to hurt her. Fortunately, she was able to break away and run to her bus. A police report has been filed. A translation of a story that appeared in Hebrew on YNET on May 13th appears at the end of this message. Noa has also already been interviewed on at least one major Israeli radio station. While this may be just one man and one incident, it is part of a disturbing pattern of disrespect for non-Orthodox streams. It is not the only time when physical harm was threatened against women who wished to express themselves though ritual observance. We cannot accept this behavior. Residents of Canada, please contact Canada@masorti.org. The mitzvah and its "punishment"
"He came closer and asked again, in a loud voice, 'Is that from tefillin?' I couldn't ignore him anymore, so I answered, 'Yes. What do you want from me?' He forcefully gripped my left arm and started kicking me." Noa Raz was attacked by an ultra-Orthodox man because of her religious beliefs. Every morning I get up and pray shacharit, with a tallit and tefillin, as God has commanded us. As a Masorti (Conservative) Jew, it is absolutely clear to me that these mitzvot – to pray, to put on a tallit, to lay tefillin – apply to every believing Jew, including Jewish women. I am used to hearing offensive comments regarding my religious beliefs, from "Conservative? What's that?" to "You're not even Jews, you're heretics." Unfortunately, I am also used to reading news about the religious violence that is raging in the country. It starts with violence against the Women of the Wall, moves on through the growing number of public bus lines where men and women must sit separately, not to mention the ultra-Orthodox opposition to the emergency room construction at the Barzilai Hospital due to some suspect bones, and where will it end up? I am not so sure that I want to know. But however much I may be used to and aware of all this, it did not help me this last Tuesday morning, when a Haredi man, with hateful eyes, decided to attack me because of my belief in God. It was 7.30 in the morning, quiet on the streets. I had stayed over at a friend's in Beersheva. We got up. I donned my tefillin. We prayed. I took my tefillin off – very routine. We left the house and I made my way to the bus station. All I was thinking about was how I could squeeze in a few extra hours of sleep before work, but things didn't quite pan out that way. A few minutes after I got to the station, I noticed an older man, in Haredi garb, standing and staring at my arm. A few more seconds went by until he realized that his stare was not transmitting his message clearly enough. He leaned over towards me, pointed to the ruddy stripes on my arm, those that linger on the skin after taking off tefillin, and asked, "Tell me, is that from tefillin?" I ignored him, but he asked again: "Is that from tefillin?" Again, I ignored him, but he moved in on me, stood right in front of me, and again asked, in a loud voice: "Is that from tefillin?" I couldn't ignore him anymore, so I looked at him and replied, "Yes. What do you want from me?" To be truthful, I was sure that as soon as I would answer him, he would spit out some curse, turn around and leave. But I was mistaken, he had just started. He forcefully gripped my left arm and simply began kicking me. Of course, he didn't forget to scream out a concoction of words such as "woman, abomination, desecration," and more. At first I just froze. I didn't understand what was going on. But after a few moments I came to my senses. I struggled with him to free myself and ran for the bus that had now arrived. I felt completely alone. The place was not busy, but there were some people around. Some looked on with interest, others turned away. Only one woman shouted back at him, "Leave her alone, already." I don't want to think what might have happened had I not managed to get away. This is not a story about a man attacking someone at a bus station. It's not even a story about violence against women. It's a story about religious violence. It's a story about attacking a person due to his/her faith, due to his/her will to serve God in his/her own way, in private, according to his/her outlook, according to his/her understanding of the Holy Torah. The problem does not only lie with that man, the attacker. It lies with those who educated him, with his leaders who shamelessly and violently talk out against any religious practice that is not Haredi. It lies with those who brought him up and nurtured him in an atmosphere in which it is permissible to say, without blinking an eyelid, that Conservative Jews are not religious, that someone from a different ethnic group is a cockroach (some Ashkenazi ultra-Orthodox parents recently referred so to Sepharadi girls who they did not want their daughters to study with), that there is only one sector (extremely austere) that decides who is a Jew. We live in a country where the strong dominate and where women are humiliated. As our society becomes more ultra-Orthodox, more extreme, these boundaries become clearer and more frightening. Pluralistic Judaism, in its various hues, works day and night to change this situation, through egalitarian and inclusive synagogues, life-cycle events for all, including everybody. In my view, these movements are saving the Jewish-democratic character of the State of Israel, and this is beyond their role in the international, public relations and educational arenas. But our country, the one that is supposed to defend us from madmen and false messiahs, as well as cultivate positive and progressive forces, this country is shooting us in the foot time and again. We can protest against the Haredim every day, but they are not the only guilty ones. They are Haredi; this is how they believe and they have the right to believe this way. It is the State that is also guilty of violence, for authorizing their every rampage; and we just carry on and keep quiet. If we don't wake up to what is happening around us, we will very soon find ourselves living on the corner of Meah Shearim and Tehran. On Tuesday evening I returned home after work. A Chabad van was parked at the corner of my street, surrounded by hassidim. I like the Chabad people, most of them are respectful of their fellow man. I have had the chance to have fruitful conversations with them, despite our fundamental disagreement. Fear paralyses, even me. Of course, the man who attacked me is not a representative sample, but to kick somebody just because she prays to God? From here to pulling out a knife, the way is very short. It makes me wonder who among us is the real Jew. The author is a member of the Masorti Movement. She has filed an official complaint with the police. As many as will hear these words at our Shabbat services, I am thankful that many more will receive them on our synagogue's listserv. I write this to call your attention and as a call to action. I really need much more time that allotted for this evening. I truly wish that it was Yom Kippur and I was speaking to the whole congregation face to face. Two weeks ago I issued a rhetorical challenge: If Israel did not exist, who would follow a Theodor Herzl - a pied piper with a pipe dream - to create it? One hundred and twenty-five years ago we had nothing. Pogroms were raging in Eastern Europe. The Holocaust was on the distant horizon. Today we have a State. Sixty-two years ago the United Nations called it into being. Can anybody here imagine living as a Jew today without having the State of Israel? How precious an entity! How fragile an existence! But that existence is threatened from within and from without, from nearby and from far away, by those who hate it, despise it and actively seek to destroy it, and by those who seek to do good, but could also lead to Israel's destruction. It is hard to tell the players without a scorecard! We don't live in Israel. We won't serve in Tzahal. We won't pay their taxes. We won't elect their government. We don't have to agree with any specific Israeli policy, and there are many with which I vehemently disagree. But as Jews, as Am Yisrael, as Goy Echad – one people, we have a vested interest, we have an existential consequence, we have an obligation, we have a sacred duty to do our part as part of world Jewry to protect and defend Medinat Yisrael. It is not my intention to whitewash anything. Sometimes Israel needs to be saved from itself, from illegal settlements, and as the current tussle over a proposed Conversion Law in the Knesset. Sometimes it is from others, Iran, Hamas, boycotts of Israeli professors. Tonight I specifically focus on the actions of the Presbyterian Church USA. You will not currently find this on the front page of any newspaper; but it will get there. You might discount its importance. That will be lying to ourselves. Background: Presbyterian Church USA created a special committee (MESC) – the Middle East Study Commission because they believe that they have a religiously driven necessity to fix the world, and specifically, peace between Israel and the Palestinians. They have issued a 179 page report that I have read and reread which will be placed for adoption in their July convention. I don't know the size of the Presbyterian Church. I have no personal interest in or knowledge of their particular theology. I can't say for sure that this document will be adopted. I pray not. I can't say for sure that this document will absolutely change American policy and detrimentally affect Medinat Yisrael. But, I am absolutely sure that it is an enormous threat and has inherent power to destabilize American support for Israel and delegitimize Israel as a constituent country among the nations of the world. 1. That Israel is a delegitimate entity that neither the League of Nations nor the United Nations had the right to create. 2. That Israel was only created because of the Holocaust and the Arab Palestinians are paying for it. 3. That tracing our roots to the land throughout the Bible and the course of Jewish history is worthless. We have no claim to any part of the land of Israel. 4. Nevertheless, with a fundamentalist reading of the Bible, Israel should behave according to it. No one else has to act that way! 5. That the true and rightful inhabitants of Palestine are the Arabs. 6. That it is the fault of the Jews for all the violence that has occurred. 7. That the occupation of the all areas since the Six Day War is a sin against God. 8. That the United States should completely reverse its support for the State of Israel by withholding financial and political aid until Israel complies with resolutions from the United Nations, no matter how one-sided, anti-Semitic, racist and suicidal they will be. 9. That companies should follow BDS – boycott, divest and sanctions against Israel. 10. That the conditions in Gaza are all Israel's fault. 11. That terrorism against Israeli civilians is legitimate. 12. That the problems of Christian Arabs, of which there are many, are Israel's fault. I will admit that I have reduced their report to very evocative language. I fully intended to do so. I need to get your attention! Even if they don't use this exact language, do not delude yourselves: this is what they are saying. This did not begin with the Presbyterian Church. This has been going on for a long time. There is along history against the creation of the State of Israel, against support of the State of Israel, and most recently the humiliation of the leader of the State of Israel. It most recently played itself out as USC Berkeley where Menachem our son waded into a room, one of the few defenders of Medinat Yisrael in a hostile environment. The PCUSA document is entitled "Breaking Down the Walls," a term taken from the New Testament book of Ephesians 2:14 which refers to the breaking down of Judaism. Who knows why they took this title? This document follows from one placed on the website of the World Council of Churches entitled "The Kairos Palestine Document" of 2009 which used the name of a 1985 document written against the then South African government and its apartheid government, which eventually world pressure brought down. They seek the same against Israel. This is no laughing, no passing, no glancing matter. The purpose of these remarks is to make those present and those on the listserv aware of these matters and shake your complacency and make you aware of the unfolding scenario. In the printed edition of this sermon are embedded links to the USCJ, CCAR and PCUSA for you to read materials first hand. We are informed that on the local level many members of Presbyterian churches do not share these positions. We need to reinforce them in their true support of Medinat Yisrael and have them vocalize that in their churches. We need to indicate how strongly we support the existence of Medinat Yisrael, even when we are advocates of change of policies. We need to say clearly that the adoption of this report as policy would be thoroughly disruptive to Jewish – Christian relations, as least with the Presbyterian Church, which we do not desire, but rather to be partners in improving the world. We proclaim for all to hear that from the essence of our souls we are most committed that the third Jewish Commonwealth, Medinat Yisrael, standing proudly and forthrightly among the family of nations, is the national liberation of the Jewish people, is the natural and proper fulfillment of our 3,500 years of history rooted in the soil in which it was born, in which it lived, whose footprints appear under every rock and stone. Israelis and Palestinians, Muslims, Christians and Jews have been partners in suffering. If all so will it, they can be partners in peace. This document, this approach, this attitude is not the way. Am Yisrael Chai. Medinat Yisrael Chai, and as Helen Zimm always adds after an aliyah, "forever and ever."